Russian Hebrew writer and poet; born at Wilna Jan. 18, 1856; settled at Grodno as a teacher of Hebrew and Russian. His literary activity began in 1873, in which year he published in "Ha-Lebanon" his first articles. Since then he has contributed to most of the Hebrew literary periodicals. 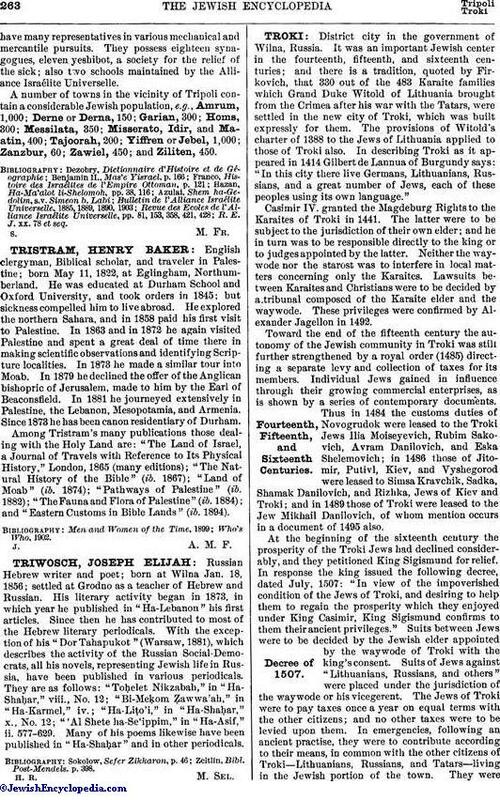 With the exception of his "Dor Tahapukot" (Warsaw, 1881), which describes the activity of the Russian Social-Democrats, all his novels, representing Jewish life in Russia, have been published in various periodicals. They are as follows: "Toḥelet Nikzabah," in "Ha-Shaḥar," viii., No. 12; "Bi-Meḳom Ẓawwa'ah," in "Ha-Karmel," iv. ; "Ha-Liṭo'i," in "Ha-Shaḥar," x., No. 12; "'Al Shete ha-Se'ippim," in "Ha-Asif," ii. 577-629. Many of his poems likewise have been published in "Ha-Shaḥar" and in other periodicals. Zeitlin, Bibl. Post-Mendels. p. 398.